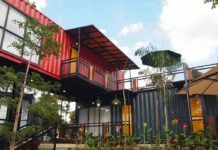 If tiny house living piques your interest, you likely take notice of a beautifully unique tiny home when you see one. 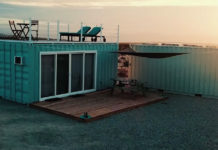 And while there are many very talented builders and designers out there with amazing tiny house creations – we know, because we admire and write about them often – there are not many we’ve seen that can rival this one. 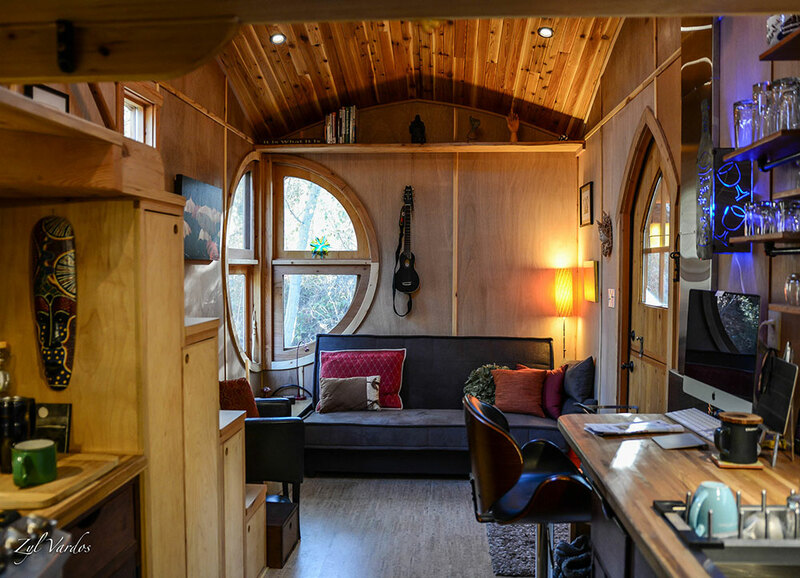 This exceptional tiny house, called Moon Dragon, is a creation of architecture company Zyl Vardos. 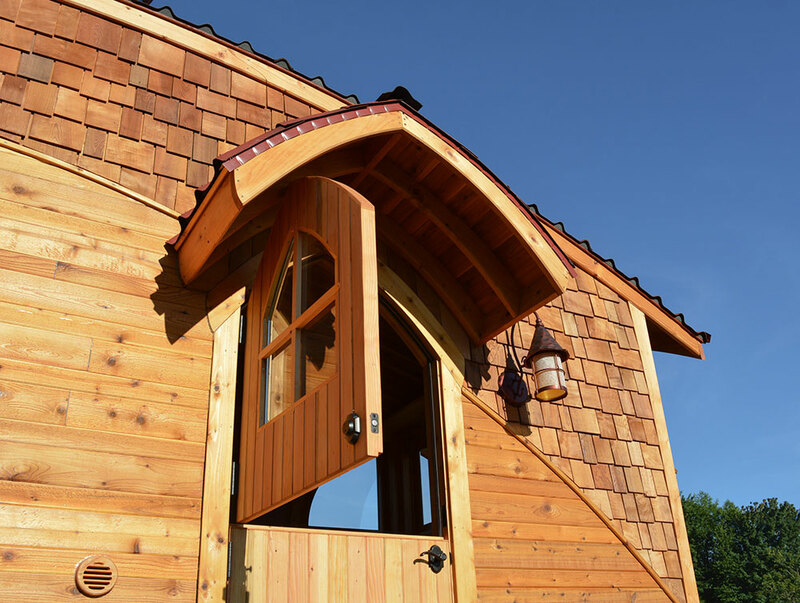 The domed roof and 5 foot overhang give this home a huge loft and the semblence of something straight out of a fairy tale. 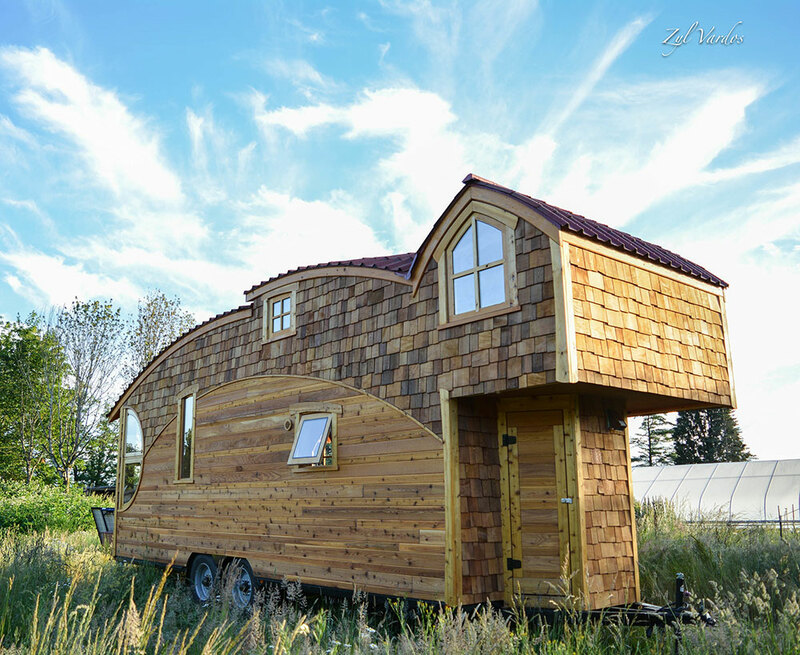 Zyl Vardos is located Olympia, WA, and was founded by Abel Zimmerman Zyl, a founding member of the American Tiny House Association. The company’s builds are recognizable by their curiously beautiful curved roof lines and uniquely shaped windows – both challenging feats in the construction world. Though one could admire the gorgeous cedar-clad exterior of the Moon Dragon all day long, the interior is definitely worth a look. The floor plan is 9.25′ by 24′ for about 222 square feet of living space, a generous size for a tiny house in a one-of-a-kind package. The kitchen includes plenty of countertop and drawer space with a sink, range, and refrigerator. The stairs leading up to the loft double as a slide out pantry for extra storage. The unusually large loft holds a queen sized bed with plenty of room to spare on both sides for end tables and for walking around. Unlike most tiny house lofts, this one also has enough room for two large closets. Not pictured is the home’s bathroom, complete with a vanity sink, composting toilet, and a shower. A small solar array provides power, and heat is supplied through a propane heater. 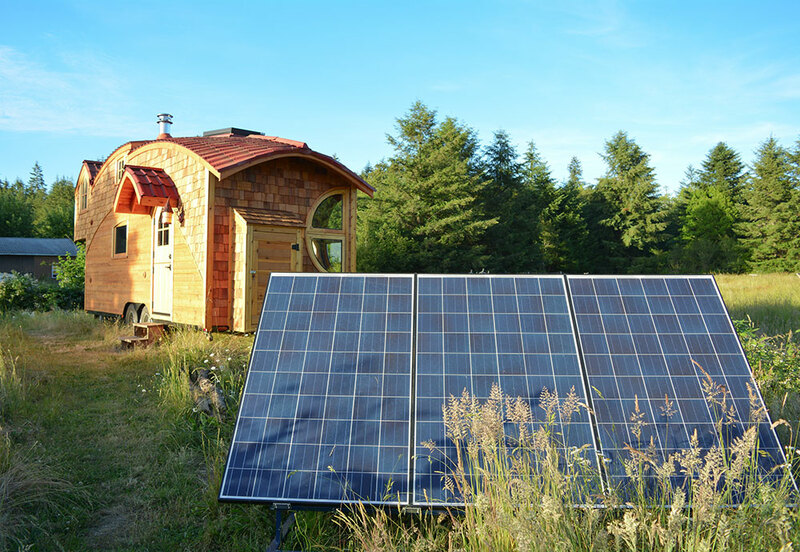 The Moon Dragon is the perfect little off grid home on wheels! 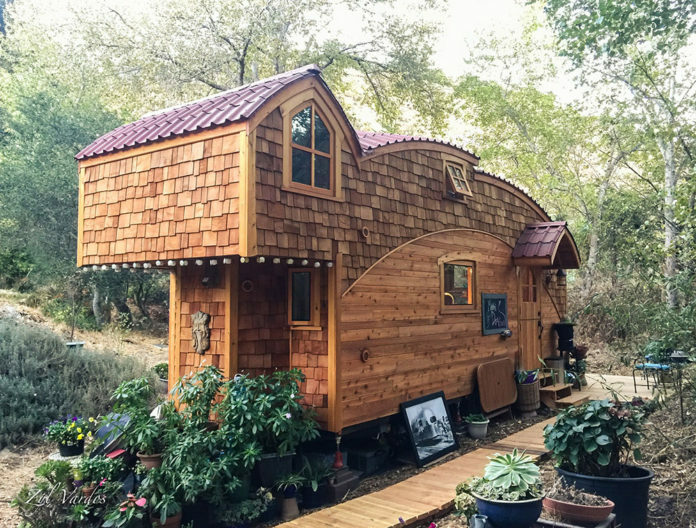 Zyl Vardos specializes in highly functional, forward-thinking, uniquely-styled tiny house structures. 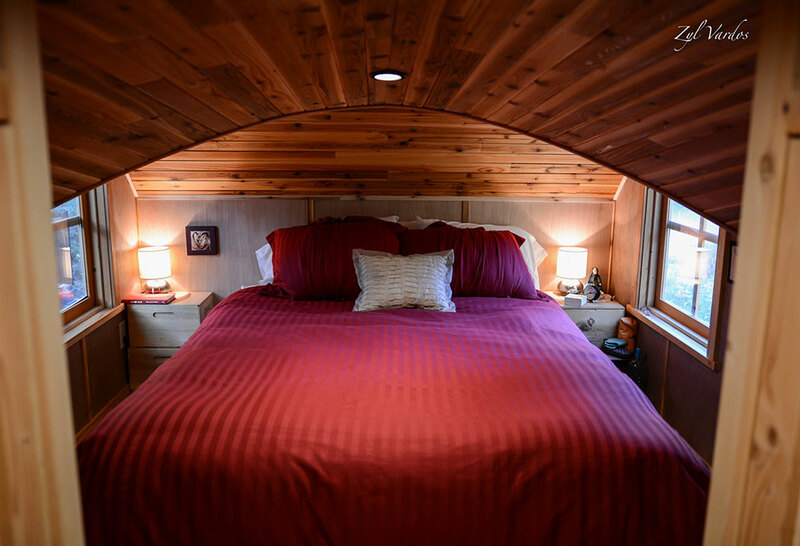 Founded in 2007 – Zyl Vardos is one of the most experienced building companies in the tiny house world. We are known throughout the world for our absolutely stunning shaped rooflines, handmade windows and doors, and bespoke interiors. The Moon Dragon, if purchased as pictured, carries a price tag of $110,000. Zyl Vardos is currently working on building their 32nd tiny house – quite an accomplishment considering the complexity of their creations!